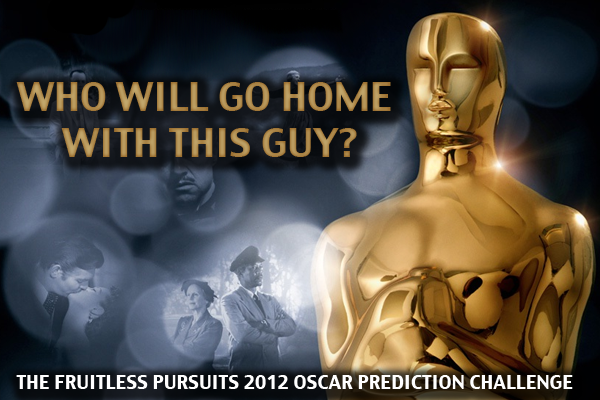 Fruitless Pursuits: The Oscars 2012 Prediction Challenge! The Oscars 2012 Prediction Challenge! The Oscar nominees have been revealed (OLD NEWS) and like every year, I will be predicting the winners of multiple awards for many movies that I've never seen. Just like my fantasy football team, my picks are 60% random, 30% semi-educated guesses, and %10 people with funny names. For anyone that wants to join in on this challenge (I'M TALKING TO YOU LUKE MILTON) add your predictions in the comments. I will start with mine, but don't bite off of my winning predictions. And together on February 26th, we will watch the Oscars, look at our lists, and see how terribly we all did! Click through the jump for the complete list of nominees, and place your votes in the comments! Demian Bichir, "A Better Life"
Gary Oldman, "Tinker Tailor Soldier Spy"
Rooney Mara, "The Girl With the Dragon Tattoo"
Meryl Streep, "The Iron Lady"
Michelle Williams, "My Week With Marilyn"
Kenneth Branagh, "My Week With Marilyn"
Max Von Sydow, "Extremely Loud & Incredibly Close"
Woody Allen, "Midnight in Paris"
Terrence Malick, "The Tree of Life"
Kristen Wiig and Annie Mumolo, "Bridesmaids"
Alexander Payne, Nat Faxton, Jim Rash, "The Descendants"
George Clooney, Grant Heslov, Beau Willimon, "The Ides of March"
Aaron Sorkin, Steven Zaillian, "Moneyball"
Bridget O'Connor, Peter Straughn, "Tinker, Tailor, Soldier, Spy"
"If a Tree Falls: A Story of the Earth Liberation Front"
"The Barber of Birmingham: Foot Soldier of the Civil Rights Movement?" "God Is the Bigger Elvis"
"The Tsunami and the Cherry Blossom"
Here are my predictions. Eat my shorts! I'm posting this without reading your picks. Jess and I are working through the movies now (We always try to watch all the main nominated movies at least) but it's too early to make picks. However, I have so, so much hate for The Descendants. Best Achievement in Visual Effects"Harry Potter and the Deathly Hallows Part 2"
Clone Wars Recap S4 E17: The Box! More Watchmen! DC's Plan to Stick it to Alan. Tuesday Bounty! Glorious Bounty Gets Confusing! Local Collector's Fair Haul Megapost!